Finding a garage capable of working on your Range Rover can prove difficult. So, I’m asking you – the owners – to help compile a list of Range Rover friendly garages which you have used in the past. Last edited by RRToadHall; April 23rd, 2018 at 11:15 AM. Facilities: Full dealership facilities - Alliegance 10% discount on parts and service for older vehicles. Any other comments: Franchised Dealership, standard labour rate (for Range Rover) £80GBP. I tend to use them where the labour charge can be kept down to a couple of hours work. Ok, let me add some EU info. I have some experience with these guys overhere in Holland. All of it good. Information current as of August, 2008. To protect your Land-Rover against theft, always remove the ignition keywhen parking. As an additional precaution the distributor rotor arm may also be removed. Any other comments: Independent that negotiates competitive rates. Honest and Fair. I would like to recommend two that I and several other owners have experience with in Arizona. The second one is in North Scottsdale, a part of the Phoenix area. Both of my recommendations are based on my cash money investment in their services, I have been to other shops, and in keeping with the spirit of this thread will not mention specifics. 97 4.0, Gen III's, BFG 265/75 TA KO's - usually muddy from being used as a divining rod for deep water in the desert. I have always used BEMW. They are so professional, cheaper than the dealers by a mile, and they certainly know the vehicles. FULL ADDRESS: Unit G21, 2a Victoria Avenue, Castle Hill, NSW, Sydney, Australia. Contact: Mark, Michael & Sam. 1997 Range Rover 4.6 HSE Oxford Metallic Blue - King Edward I. Any other comments: Independent, RR specialised, decent tariff. I've used these guys since owning the P38 and they're top rate, always good service and reasonable rates. Always willing to help. Highly recommended. They can handle all Land Rover models, the owner races Bowler Wildcats too in Off Road Championships so they know their stuff. 95 Range Rover 4.6 HSE PowerFlow Stainless Exhaust...nice meaty V8 Rumble. Any other comments: Land Rover, Bmw & Mini, Ase Certified Master Technician, on his own for about 5-6 years, now. Was with the local LR dealer for about 8 years (i think). Very honest, very good person and will take great care of your LR. I would recommend him to the end of my days! Any other comments: Independent shop that primarily works on Lotus, Jags, Rolls / Bentley, Rovers, and anything else british (but mostly Lotuses really). Labor rate on basic stuff about 95/hour and they have all the facilities to full service your rover. Harry (the owner) is a great guy and very honest and easy to work with. I had them put my air bags in on the P38 and calibrate the computer, and some other services. Great shop. The also fix my lotus. Full Address: Unit 2a Rushey Platt, Farm Trading Estate, Caen View, Wootton Bassett Road, Swindon. 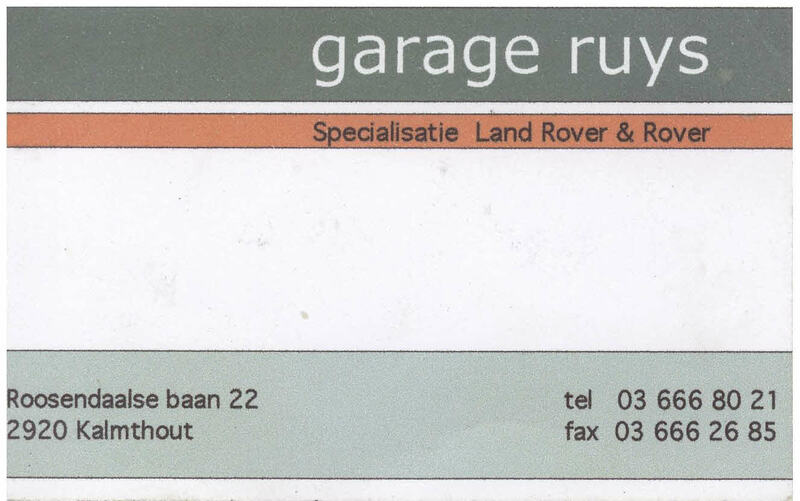 Facilities: range rover diagnostics and service. Any other comments: local guy called simon, very helpfull, knows his stuff. 2001 range rover 4.6 hse vogue auto Java black. Facilities: Service and preparation, parts and accessoires, Rovacom diagnostics, workshop for rent. I've had Alan and crew work on my '96 Disco and '01 HSE. Top notch work and always fair pricing. '88 BMW 327i - Track Toy! I have not taken the rangey down to them yet. So far they have been extremely helpful over the phone and on one occasion they took the time to talk me through a job i was doing myself; their advice was spot on and at the very least demonstrates the right attitude to fellow owners (they own and drive P38's).